Seaport Village offers some of San Diego's best shopping, dining and entertainment. With more than 70 shops, restaurants, and attractions, you and your family will be entertained for hours. Featuring some of the best outdoor entertainment in San Diego, Seaport Village is fun for everyone. 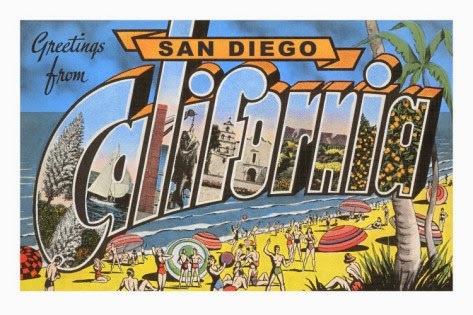 Looking for some new clothes or a souvenir from your trip to San Diego? The Gaslamp Quarter is San Diego's historic heart as well as its dining, entertainment and urban shopping district. It is a 16 block historical neighborhood in Downtown San Diego and is the center of downtown night life. The Quarter is home to many events and festivals, including Mardi Gras in the Gaslamp, Street Scene Music Festival, Taste of Gaslamp and ShamROCK, a St. Patrick's Day event. PETCO Park, home of the San Diego Padres is located one block away in downtown San Diego's East Village. Balboa Park is a 1,200-acre urban cultural park in San Diego, California. In addition to open space areas, natural vegetation green belts, gardens and walking paths, it contains a variety of cultural attractions including many museums, several theaters, and the world famous San Diego Zoo. There are also many recreational facilities and several gift shops and restaurants. This area has the most beautiful coastline in San Diego and is your best bet for an afternoon or day at the beach or exploring the coast. La Jolla Shores beach is all-round the nicest beach in the area with excellent swimming, changing rooms, easy parking, harmless leopard sharks, and kayak rental shops one block away. You can explore the rocky La Jolla Cove with its coastal trail, sea caves, and baby seals at Children's Beach. You can also browse the shops, galleries and restaurants in trendy upscale La Jolla Village, or visit the excellent Birch Aquarium which is part of the Scripps Institution of Oceanography. There are many restaurants. Some standouts include Georges At The Cove Ocean Terrace, Whisknladle, and The Cottage. A little further north the adventurous can find the Knoll at Scripps Coastal Reserve, a hidden gem with awesome views from the top of the 350ft+ sea cliffs (the highest in Southern California) and Torrey Pines State Reserve for hiking and exploring. This is the epicenter of beach culture in San Diego. It's a peninsula with the ocean and a lively boardwalk on one side, and peaceful Mission Bay Park on the other. Charming alleyways with tiny beach houses criss-cross the peninsula. Mission Bay Park has a great bike/jogging path around the lovely Sail Bay in its northwest corner. Just to the north is the busy Pacific Beach commercial area and Crystal Pier, and just north of there is the quieter Pacific Beach, with its mellow surfing scene. This area is not as swimming friendly as La Jolla Shores because of the heavy shore break. A nice place to eat with a sea view is JRDN restaurant in the strikingly modern Tower 23 Hotel. Two great inexpensive places for breakfast or lunch are the Rubicon Deli and The Mission. You can rent sailboats, kayaks, and SUP boards, for use on Mission Bay, at the Mission Bay Sports Center. Belmont Park in the south part of Mission Bay is touristy and not recommended. For the adventurous a lovely long walk is to head north along Mission Beach, go up the steps at the far north end of Pacific Beach, and then walk through the Bird Rock neighborhood with its hidden coastal access paths to Windansea Beach. The USS Midway opened in 2004 as a naval aviation museum. Imagine experiencing life at sea aboard one of America's longest-serving aircraft carriers. Visitors to the USS Midway Museum enter a floating city at sea and walk in the footsteps of 225,000 Midway sailors who served our country. The USS Midway Museum is an unforgettable adventure for the entire family. Guests can spend the day exploring more than 60 exhibits with a collection of 25 restored aircraft. The self-guided audio tour, narrated by Midway sailors, brings the carrier's history to life. Those who dare can "take to the sky" aboard one of three flight simulators. The Old Point Loma Lighthouse stood watch over the entrance to San Diego Bay for 36 years. At dusk on November 15, 1855, the light keeper climbed the winding stairs and lit the light for the first time. What seemed to be a good location 422 feet above sea level, however, had a serious flaw. Fog and low clouds often obscured the light. On March 23, 1891, the light was extinguished and the keeper moved to a new lighthouse location closer to the water at the tip of the Point. Today, the Old Point Loma Lighthouse still stands watch over San Diego, sentinel to a vanished past. The National Park Service has refurbished the interior to its historic 1880s appearance - a reminder of a bygone era. This area in the north west part of downtown San Diego is a quieter alternative to the Gaslamp for a place to go in the evening. It's more relaxed and less hectic. You can walk there from the Convention Center or take a rickshaw, and it also has its own trolley station. The area has some great modern architecture and many restaurants and cafes reflecting the Italian heritage. Some recommended restaurants are Bencotto, Buon Appetito, Sogno Di Vino, the Indigo Grill, Napizza, PrepKitchen, Influx, Underbelly, and, further south, the Karl Strauss Brewery. To the east of India Street be sure not to miss the amazing bakery/cafe Extraordinary Desserts in a restored industrial building. Horton Plaza, officially Westfield Horton Plaza, is a five-level outdoor shopping mall located in downtown San Diego and remarkable for its bright colors, architectural tricks and odd spatial rhythms. It stands on six-and-a-half city blocks and is adjacent to the city's historic Gaslamp Quarter and is currently anchored by Macy's and Nordstrom. It was the first successful downtown retail center since the rise of suburban shopping centers decades earlier.